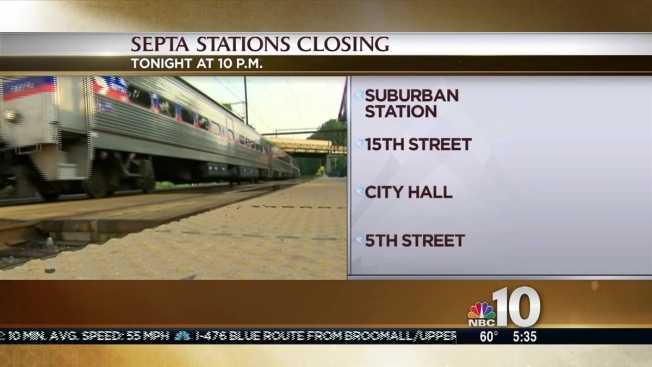 SEPTA urges people to take their time getting to trains and even stop to grab a bite or relax prior to getting to the train since tens of thousands will be looking to board the train after Mass. SEPTA reminds passengers taking Regional Rail home to board at the same station where they were got off. Passengers on the Broad Street Line subway should expect lines on the street level before heading down to the Walnut-Locust Station. If lines become too long, SEPTA is ready to use shuttle buses to get passengers to the Stadium Complex. Passengers can also board the Market-Frankford Line subway at both 30th Street and 8th Street, said SEPTA. New Jersey Transit will resume service on its River Line from Camden to Trenton at 5 p.m. Sunday. Trains will run every 30 minutes between the Walter Rand Transportation Center in Camden and the Trenton Transit Center until 7 p.m. The frequency will then increase to every 15 minutes to accommodate people returning from the papal Mass in Philadelphia. When service is restored, papal tickets and all other valid tickets will be accepted, including My Tix and Family Supersaver tickets. NJ Transit says it's able to resume service early due to light ridership on exclusive papal trains, which have been operating since Saturday morning. It also ensures all River Line equipment will be in proper position for Monday morning, when full service resumes between Trenton and Entertainment Center Station in Camden. Not only roads will be impacted by Pope Francis’ visit to Philadelphia as SEPTA, New Jersey Transit, PATCO and DART make changes to service through the weekend. Here's a comprehensive list of local public transit changes due to the papal visit. SEPTA will be running special service on many of its routes and will be detouring many Center City routes on Saturday and Sunday. Those closures will remain in effect through the weekend until Monday. SUBWAY: The Broad Street and Market-Frankford subway lines will only serve limited stations on Saturday and Sunday from 5:30 a.m. to 1 a.m. the next day. On the BSL Fern Rock Transportation Center, Olney Transportation Center, Erie, North Philadelphia, Cecil B. Moore, Spring Garden Walnut-Locust, Snyder and AT&T Station will be open. On the MFL 69th Street Transportation Center, 60th, 52nd, 34th, 30th, 8th, 2nd, Girard, Huntington, Allegheny, Erie-Torresdale, Arrott Transportation Center and Frankford Transportation Center stops will remain open. REGIONAL RAIL: The following Regional rail stations will remain open with special passes needed to board trains (pass sales end Friday). SEPTA reminds riders to board trains at the same station they get off at once festivities end for the day. Terminals A/B, C/D (dropoff at Jefferson Station and University City). The Airport Line will run about every 30 minutes and will at time also serve Wayne Junction, Melrose Park and Jenkintown/Wyncote stations. Click here for schedule. SEPTA BUS detours go into effect stating at 6 p.m. Friday and ramp up entering the weekend. Routes 12, 43, 44, 48 and 61 will be suspended through the weekend. Routes 1, 4, 7, 8, 10, 12, 17, 30, 35, 43, 44, 47M, 48, 57, 61, 62, 64, 65, 78 and 80 in the city and Routes 106, 115, 118, 120, 126, 133, 204, 205 and LUCY will be suspended on Saturday and Sunday. City Routes 3, 5, 6, 11, 13, 14, 15, 15B, 16, 20, 21, 22, 23, 27, 31, 33, 34, 36 42, 47, 50, 52, 55, 58, 66, 70 and R; and suburban routes 99, 103, 104, 107, 108, 109, 110, 112, 113, 123, 124, 125, 201 and 206 will operate on detoured or modified routes. Tokens and monthly passes will be accepted on bus routes that are running. ALTERNATE ROUTES: SEPTA suggests checking its website for the special schedules for detoured or modified routes. On Saturday and Sunday, trolley Routes 11, 13, 34 and 36 will make regular stops up to the 40th Street Portal. Route 10 will be suspended. Also, night owl service will be curbed Friday and Saturday night along the Market-Frankford and Broad Street lines (no service 12:30 to 5:30 a.m.) as well as along trolley routes (no service between 3 to 5:30 a.m.). SEPTA will operate limited CCT service. Click here for info. Click here for a full list of papal weekend service changes on SEPTA. Due to expected large-than-normal crowds, PATCO will only pick up passengers at its Broadway (Walter Rand Transportation Center), Ferry Avenue, Lindenwold and Woodcrest stations. The trains will then only stop at the 9th/10th & Locust Station in Center City on Saturday and Sunday – service starts at 6 a.m. Saturday. Special $5 Freedom Cards are available for each day and thousands of the passes remained available heading into the weekend. PATCO warned riders to expect parking spaces at the stations to fill-up quickly. NJ Transit will run special service along its Atlantic City Rail Line and River LINE. Atlantic City City Rail Line trains will originate in Atlantic City and go directly (non-stop) into Philadelphia’s 30th Street Station with trains running hourly between 6 a.m. and 2 p.m. each day. Returning trains will leave following the large public events along the Ben Franklin Parkway on a “load and go” basis, said NJ Transit. The River LINE will run about every 15 minutes from Trenton to Camden so that riders can then either pick up PATCO or make the pilgrimage across the Ben Franklin Bridge. Other stops along the way include Pennsauken Transit Center, Pennsauken Route 73, Burlington South, Florence and Brodentown. Special tickets for both lines have been expanded and can be purchased online. Due to road closures around the Wilmington Amtrak Station, DART will move the station stop for Routes 2, 6, 11, 12 and 301 one block up Martin Luther King, Jr. Boulevard to King Street. The RiverLink service will also be running to take passengers across the Delaware River. The best bet if you need to get someplace this weekend is to check the agency's website prior to going.